EQDIR and EQMod has a mosaic function, a lot of people dont use EQMod so I'll demonstrate how to do it manualy...How I do it in fact. This will be more of a hints and tips tutorial than a full blown howto. Tip 1. Make sure your camera is aligned to the scopes axis ie. when you move in RA the stars move horizontaly or virticaly across the screen, this will make life easyer later on. Scroll down the page a bit to find the download. Its a re-sizable, rotateable cross hair that you can position over your capture screen. OK you have your first subs in and now need to move to the next bit of your image. In the screen captures below I'm using processed images to show what is going on, yours will be dimmer but we are using stars so they will show. 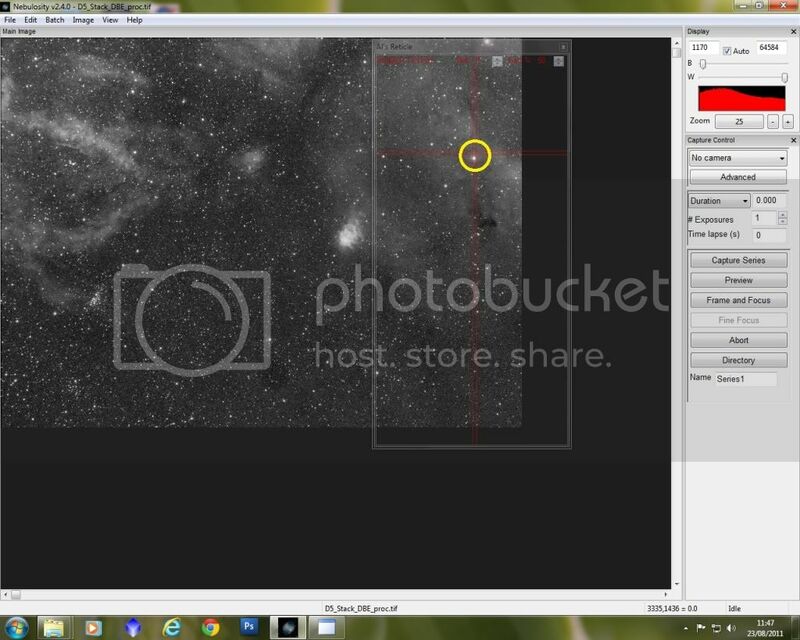 Now we need to move that star to the top of the screen ie move the mount down for a 2 panel mosaic with one pane above the other. 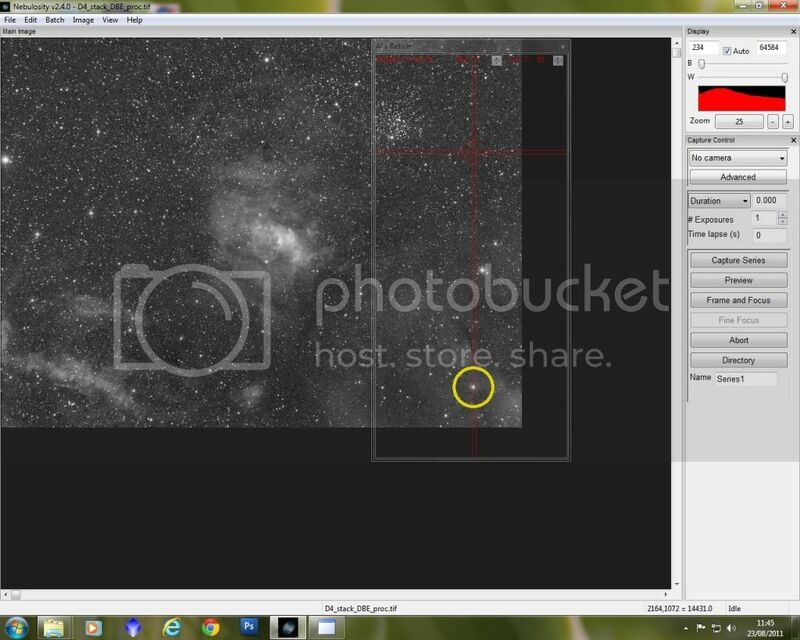 Image 2 showing the new position of the star near the top of the screen. On my screen, ccd/scope combination North is to the right, East is at the bottom. So I have just moved East in RA untill the star is near the top of the screen. I do this by setting my CCD to do 1 second captures at 4x bin loops. Now you can capture the next set of subs. Its best to get the same amount as the first capture, it will make processing easyer, it also helps if the seeing is the same as well. Capture more frames than you need and discard any that arn't up to scratch. I use Photoshop for this, what I usualy do is to do a series of Levels stretches to the first image and make a note of how many and what level I do them at, so it might be a series of middle slider to 2, 2, 2, 1.5 I do this until I can see the structure of the image start to show. Now do this to the next image using the same Levels stretches as the first, to get the background even. Save both images. There are lots of ways to join these 2 images together. Microsoft ICE being one of these. This is easy to use, just drag and drop both images to the window and it will start automaticaly...when finished hit the Export button and save the joined image. Open in Photoshop or whatever you use and carry on processing to get the best image you can.